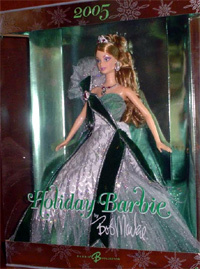 2005 Holiday Barbie was designed by Bob Mackie and was the 17th Holiday Barbie doll. She is wearing a burgundy and silver gown with silver glittery accents and a burgundy velvet sash with tulle "starburst" at the shoulder. She has a matching tiara, brooch, necklace and earrings. There was a Sears Exclusive version of this doll wearing a green green version of the gown. 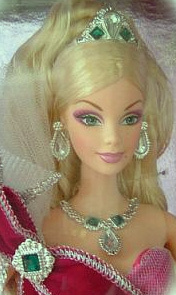 The regular Holiday Barbie has green stones in her jewelry, the Sears Exclusive Holiday doll has magenta colored stones. Both dolls come in a silver box with snowflakes - the display background and writing on the boxes are accented in colors matching the gown. 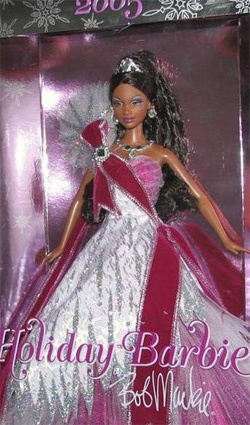 There is an African American version of both dolls. 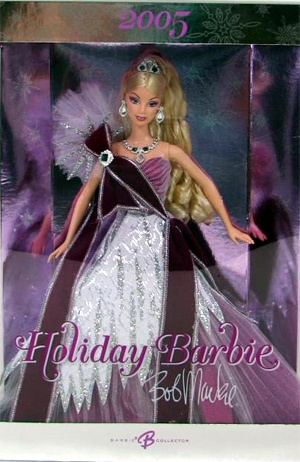 There was also a 2005 Hallmark Holiday Barbie Ornament.